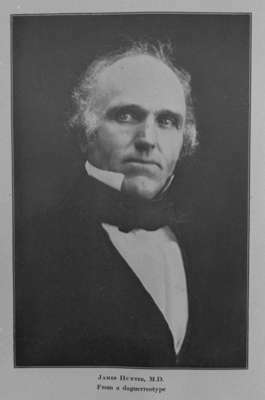 A black and white portrait photograph of Dr. James Hunter (1795-1875). This photograph is from "The Descendants of Dr. James Hunter" by Edwin G. Hunter, B.D., Frederick H. Hitchcock Genealogical Publisher, 1925. Dr. James Hunter was born at Yorkshire, England on September 29, 1795. The place of his birth is thought to be Thornton, but this is uncertain. He and Elizabeth Story were married in 1814 at York Cathedral. He operated a school in England until 1822 when he and his (wife and three children) came to Canada. He graduated in medicine from the College of Physicians and Surgeons of the Western District of New York, at Fairfield, Herkemer County, in 1829. From Smithville he moved to Whitby Township where he farmed and practised medicine on the Kingston Road halfway between Whitby and Oshawa. Dr. Hunter was a Reformer but did not support William Lyon Mackenzie's plans for an armed rebellion in 1837. He was one of 19 signatories of the Declaration of the Reformers. He was arrested and tried for treason the day Lount and Matthews were hanged in 1838. He was acquitted but later had to flee for his life to Buffalo, New York, via Oshawa harbor. After staying in Hartland, Niagara County, New York, for a time, he returned to Canada and purchased land at Brooklin. He traveled to the American West in 1851 and about 1856 moved to Lewiston, New York. After his wife's death in 1863 he moved to Ann Arbor, Michigan. He died at the residence of his son-in-law, Dr. W.F Bartlett, at Buffalo, New York on April 20, 1875.